MA Curating and Collections at Chelsea College of Arts present an exhibition exploring the working relationship between the acclaimed theatre and film designer, Jocelyn Herbert, and the playwright and author, Samuel Beckett. The materials for the exhibition are selected from the Jocelyn Herbert Archive at the National Theatre, the NT’s only archive dedicated to a designer. The archive includes sketchbooks, set and costume drawings, annotated scripts, research material, notebooks and diaries, masks and puppets, correspondence, personal photographs and official production photography from rehearsals and performances. 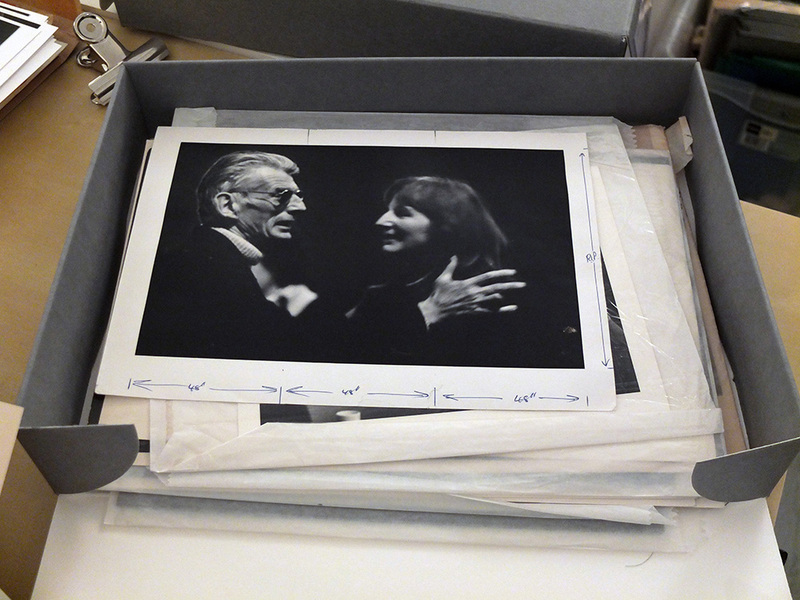 Herbert’s working relationship with Beckett spans from the 1950’s to the 1970’s; using artefacts from the archive the exhibition will reveal aspects of the biography of Jocelyn Herbert, her personal and professional relationships, and will give a unique insight into the theatre making process. This show is curated by the Exhibition Studio Workshop – the practice-based unit of Chelsea’s MA Curating and Collections course. It is part of a series of shows entitled Work From the Collections, and is the inaugural exhibition in what is hoped will be an ongoing series exploring the Jocelyn Herbert Archive at the National Theatre. Image: Samuel Beckett and Jocelyn Herbert. Photo from the Jocelyn Herbert Archive at the National Theatre. Registration Now Open for April Conference! Hannah Simpson (Boston University), “Is there anything you ever write for an actor that isn’t physically painful?”: The Actor’s Physical Suffering in the Beckettian Production. Andrew Head (University of Hull), Beckett’s Implied Actor: Debts, Legacies and a Contemporary Performance Culture. Niamh Bowe (University of Reading), Ethics in Contemporary Performance: Not I, Footfalls and Rockaby at the Royal Court Theatre, 2014. 20.00 Conference dinner at Loch Fyne, The Maltings Bear Wharf, Fobney St, Reading. See separate registration via the Online Store. If attending the dinner, you must book in advance. This is an interactive session utilizing the ‘Waiting for Godot at 60’ exhibition materials in order to critically reflect on how such archival materials help to generate performance histories. The session will provide an opportunity to engage with issues which are important within Beckett Studies and in theatre and performance studies more generally such as the processes of documenting performance, the ways in which we remember (and forget) performance, the elements of performance that the archive fails to record, the problematics of generating narrative from archival remnants, and the relationship between the archive and the institution. 17.30 – 18.30 Closing remarks and repair to Park House on the University of Reading campus.